Buy Biona organic date syrup 350g in the UK from our online shop or directly from our independent Scottish store. A vegan recipe using Greek style cheese from Bute Island, couscous and dates. This recipe contains 2 tbsp date syrup. This recipe contains 1 tbsp of date nectar. Our Italian wwoofer gave us this recipe while staying with us. It's a very healthy breakfast and so easy to make! This recipe requires no cooking! Raw and tasty. This recipe contains Date syrup to taste. As official Biona stockist, we sell genuine Sugar & Sweeteners directly from our shop in Scotland and online throughout the UK. At Biona organic, their farmers don't use chemical pesticides or herbicides on crops, and they don't grow genetically modified plants. Biona organic also makes sure they only use sustainable farming methods and do not work their land intensively. View more products from Biona. Where can you buy real Date Syrup - Organic safely online? If you are wondering where you can buy Biona organic date syrup 350g safely online in the UK, then shop with us. We are an actual health foods shop; with real people selling real foods and products. Our award-winning independent shop is located in Stirling, Scotland since 1976. You can buy our Organic foods suitable for vegetarians and other genuine Sugar & Sweeteners in store or safely place an order with us online or over the phone. 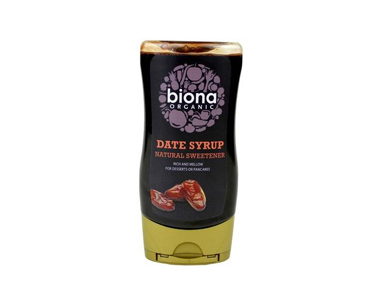 Date Syrup - Organic - Biona organic date syrup 350g in Sugar & Sweeteners and Foods.